It is likely that your initial motivation for setting up a photography business was to do with an existing passion for photography in general. Most entrepreneurs in the creative industries are driven to set up their own business by a desire to turn a hobby or interest into a full-time profession. As such, you may not have given much consideration to the more mundane, day-to-day aspects of running a business. One of the most important considerations to address (and one which should become abundantly clear during the writing of your business plan) is the way in which you will deal with debt and debtors, and your mechanisms for ensuring that you are paid in a timely fashion. The failure of a client or customer to make payment on time can present significant cash flow problems for your business. Finances are difficult to keep on top of at the best of times, but if you are dealing with clients who consistently make late payments, the day-to-day running of your business can become untenable; the worst case scenario is that, while your business may have sufficient assets in the form of accounts receivable, it lacks enough cash to continue to operate. In order to avoid this situation, and to ease your finances generally, it is essential that you decide how you will deal with debt and debtors well in advance. In the first instance, you should think very carefully about whether or not you will offer credit to customers. This should be a key element of your business plan, and your cash flow forecasts will depend on this. It is good practice to offer credit only in sectors and fields in which this is the norm. Furthermore, you should remember that most companies will only carry debt for other business clients; few small businesses are willing to extend credit lines to private clients, and there is little motivation for you to do so. 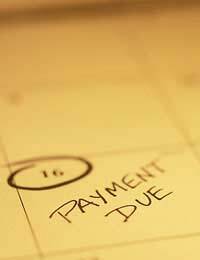 However, if you are not insisting on payment in advance of services rendered, you must be prepared for late payment. Your business plan should include clear policies for dealing with those who fail to pay on time. You should develop a timeline that will make clear when you should begin to take action against your debtors to clear their debt. This process should begin with a polite telephone call; this first call will normally ask whether or not the invoice has been received, and is generally the only push required to get a client to settle their debt. If non-payment continues, however, further action will be necessary. The next step is normally a reminder letter; this should be delivered by post and printed on your company letterhead. It should give details of payment methods, including your bank details if you take payment via BACS; frequently, non-payment occurs simply because the customer has lost the creditors bank details. If a customer still fails to make payment after this point, you should consider taking further action. You may wish to investigate engaging the services of a debt collection agency. There are many such companies operating in the UK, and most charge around £50 to clear an invoice. Clearly, therefore, you should take a view on whether or not the value of the invoice is sufficient to warrant this action. It should be stressed that this is a final solution only, and should not be rushed into; if you are too hasty in engaging a debt collection agency, there is little chance that you will secure any potential repeat business. If you are having cash flow difficulties as a result of unpaid debts, you may wish to consider factoring. This is a way of easing your finances by selling on accounts receivable. Further information on factoring is available in an article elsewhere on this site.